They say naturally aspirated diesels are best. Hmmm... Are these the same they who tell us it will be a rough winter? Or the they who say it&apos;s best to have white wine with fish? Or perhaps it is the same they who know so much about so many things. Just who are they? Well, I don&apos;t know much about the ubiquitous they, but the issue of turbocharging is definitely not the same question it was twenty years ago, or even five years ago, or whenever they started talking to us about engines. In fact, turbocharging is so much a presence in today&apos;s modern diesel engine world that it may soon be hard to even find a new naturally aspirated diesel in an engine manufacturer&apos;s lineup. Diesel engines are different from gasoline engines in that compression from a piston in a cylinder is what ignites the fuel. High compression ratios generate high temperature, which explodes the fuel and air mixture after it is injected into the diesel&apos;s cylinders via intake ports. In a naturally aspirated diesel, this fuel/air mixture is literally sucked into each intake port by the vacuum created by exiting exhaust gases. As the speed of the diesel engine increases, this vacuum pulls in even more air and diesel fuel, so the engine runs faster, developing higher horsepower levels...more power. Remember the air scoops on hot rods back in our youth? The idea back then-besides looking cool-was that the more air that could be shoved into the engine, the more fuel mixture could be burned, to generate more horsepower. These hood scoops did a fairly good job of ramming large quantities of air into the engine&apos;s carburetor at high speed. Those early attempts for better performance engines were soon eclipsed, however, by the development of turbocharging, which is a mechanical method of pushing even higher quantities of air into an engine. At its most simplistic level, a turbocharger is an air pump, providing the engine with massive quantities of dense, compressed air to mix with fuel. Instead of relying on a vacuum to pull the air/fuel mixture into an engine for combustion, turbocharging literally rams the mixture into the engine&apos;s intake manifold under pressure, and the engine develops considerably more horsepower at a given rpm as a result, much more than would be seen in a non-turbo, or naturally aspirated, configuration. The turbocharger is powered by the engine&apos;s exhaust gases, which turn the blades of a turbine. This fast-spinning turbine (often close to 100,000 rpm) is attached to a compressor wheel, which pulls in air through the air filter system and compresses it under pressure as it is forced and then mixed with fuel, and sprayed through an injector into the engine for combustion. Turbocharging simply packs more air into the engine, and more horsepower is obtained from a given engine block. Small turbocharged engines can easily outperform larger, naturally aspirated engines. Okay it all sounds so good, so what&apos;s the problem? Well, up until recent years, there were some gremlins with turbocharging. To begin with, a tremendous amount of heat is generated by the turbo as it works its magic. In some instances a turbocharger could glow cherry red, so hot from the work it is performing that it becomes a fiery demon on top of the engine. If an oil or fuel line bursts near such a turbo, there is a definite risk of fire in the engine space. This has been a major cause of vehicle and vessel fires. Also, when an engine was shut down, the heat of the turbo would literally cook any oil left on the turbine bearing surfaces, leaving a coating of shellac that eventually adds enough friction to destroy the turbo bearings. The legendary long life of a diesel engine was thought to be compromised by adding a turbocharger. It was an acceptable tradeoff for some high speed applications, but certainly not for trawlers and long distance motorboats, where reliability is cherished above all else. But even for us passagemakers, there just aren&apos;t many naturally aspirated engines available these days. There must be a reason for this, so I decided to find out why. I spoke with several experts in the diesel engine industry to share their thoughts about turbocharging, and its role in the modern marine diesel engine. Rather than a discussion of tradeoffs and acceptable risks, I found that all of the major manufacturers consider turbocharging an excellent way to generate required horsepower levels in engines, and also that the evolution of turbocharging has come a long way indeed. I learned that naturally aspirated marine diesel engines appear destined to pass into extinction. To understand why this is happening, let&apos;s put some things into perspective. The entire marine industry is but a minuscule segment of the overall diesel engine business. 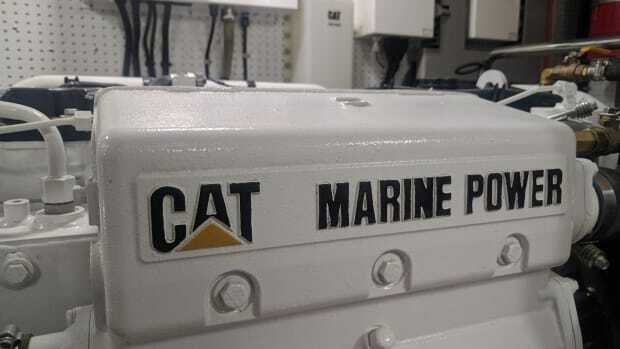 All pleasure and commercial marine diesel applications combined still only represent single-digit market share in a world of transportation (cars, trucks, and buses), construction equipment, and fixed building applications such as generator stations and UPS systems. Given this position in the diesel engine food chain, it should come as no surprise that what drives the bigger segments will impact the marine industry. In recent years, there have been significant steps taken to address emissions control for environmental reasons. With the enormous number of diesel engines around the world, the engine manufacturers will soon be held to much higher standards of emissions control. In terms of environmental friendliness, one benefit of turbocharging is that it allows a more complete combustion of fuel in the engine, significantly reducing the levels of emissions exhausted into the world&apos;s atmosphere. Turbo boost actually cleans the cylinder combustion bowl and exhaust port for a more complete fuel burn. It is this benefit that makes turbocharging good for the environment, so much so that all highway and construction diesel applications are using turbocharging as a way to meet cleaner emissions standards. Bob Tokarczck of Bell Power Systems, a Deere Marine distributor in Essex, Connecticut sees this as signaling the end of naturally aspirated diesel engines. "Most of the markets after the year 2000 will require emissions-certifiable engines. 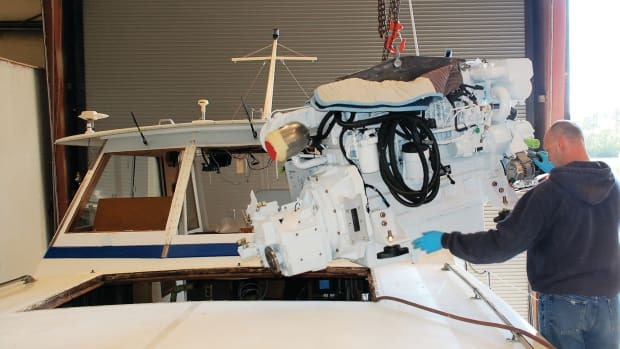 Other markets, such as the marine industry, are so small that it is just hard to justify naturally aspirated diesel engines," Bob explained. "And it is only a matter of time before marine engines are required to be emissions-certifiable as well." As for reliability, Tokarczck feels the turbo is no longer the time bomb it may have been in the past. "When turbochargers came out twenty-plus years ago, they had their share of problems. Today it is a different story. "Turbos and turbo housings get very hot. It used to be that when a hot engine was shut down, the turbo would bake the oil out of the bearings, causing premature engine failure. The designs and materials are much better today, and the turbo itself is cooled by the engine&apos;s cooling system." Greg Hasler, Marine Project Engineer at Caterpillar, agrees. "Bearing technology has improved a lot in the last five years. When a turbo is properly matched to an engine rating, or family of ratings, the higher air/fuel ratios create more power with lower emissions," he said. "The vast majority of diesel engine sales today are turbocharged engines, to fit the higher power demands of commercial applications. It is almost impossible to meet these demands with naturally aspirated diesel engines." Another perspective in the history of turbocharging came from Doug McElroy of Alaska Diesel Electric. 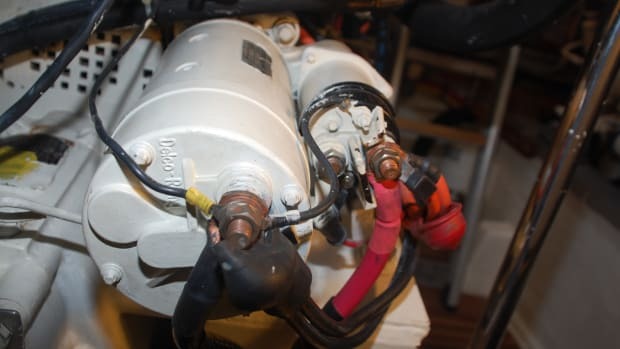 It seems the relatively small marine market first saw some inappropriate turbocharged diesels put into marine applications. "At one time, there was improper matching of turbochargers to engines that went into boats," Doug told me in a recent conversation. "Turbocharged engines, originally designed for truck and bus operation, were put in boats. Marine use is quite different from highway operation, however, and requires a different adaptation." McElroy continued. "Marinizers took naturally aspirated diesel engines and just added turbochargers, which we now know is a pretty delicate operation. You need to match the balance between the output of the turbo and the requirements of the engine for each specific application. "Also, in the early years of turbocharging, they did not understand the need for outstanding lubrication in the turbocharging circuit. We do now." Everyone in the industry agrees that turbocharging is here to stay, and that the benefits of turbocharging are good for our trawlers and the environment. None of these experts feel that turbochargers add a delicate or risky component to a diesel engine, or that turbocharging makes maintenance a bigger issue. The reliability of today&apos;s turbochargers is the same as the rest of the engine. Long life is the norm. But there are some caveats about operating a diesel engine with a turbocharger, and there is agreement that basic operating knowledge is the key to long engine and turbo life. Lloyd Morley, Customer Support Manager for Cummins Marine, told me of Cummins&apos; long history of turbocharging, dating back to 1951 when they put turbochargers on Indy racing cars. This long term experience has helped them understand what works and doesn&apos;t work in marine applications. "How the engine is geared and understanding how it will be run is very important," Morley explained. "If it is run at low throttle and not geared correctly, an engine is running naturally aspirated, and the turbo is nothing more than a plug in the intake port." Morley feels matching gearing to application is vital. "Since it&apos;s best to run a turbo diesel in its designed range, proper gearing is important. That is the key to successful operation." "If you run a naturally aspirated diesel and a turbocharged diesel at twenty percent, the turbocharged engine will be distressed sooner. Running underloaded is bad for all diesels, but especially for turbocharged diesels," Alaska Diesel&apos;s Doug McElroy pointed out. Caterpillar&apos;s Greg Hasler concurs. "The biggest problem with turbocharged diesels, when properly matched to a specific rating, is running them way below that rating. There is not enough turbo energy to give the boost to burn the fuel. Diesels like to work." Hasler was also clear on some danger areas. "Turbocharged engines take slightly different care than naturally aspirated engines. Start up and shut down are the areas where turbochargers are most at risk," he said. "Most engine wear occurs at start up. It is bad to put a heavy load on a turbocharged engine immediately after start up, before the components have come up to temperature. It is important to warm up a diesel engine." And he added that knowing how to shut down an engine is equally important. "It is okay to shut down a hot naturally aspirated engine, but that&apos;s really bad for a turbocharged diesel. To avoid coking of oil on the bearings, it is a good idea to let the engine idle for a minute or two," Hasler explained. "That is the best way to shut down a diesel engine. Oil and engine temperature drop pretty quickly." Cummins Marine&apos;s Lloyd Morley had some other tips for keeping an eye on a turbo diesel. "It is a good idea to annually check the end play and radial side clearance of the turbo shaft." He then added, "Turbo bearings float on oil these days, so the problems are now minimal." Change your engine oil regularly. "It&apos;s also a good idea to check your exhaust riser each year and look at the blades of the turbo for signs of water leakage," Morley continued. "It&apos;s important to keep exhaust back pressure as close to zero as possible for long turbo life. Turbos need to be able to spool up quickly, and high back pressure causes the engine to dump more fuel than the turbo can supply air, causing black, sooty smoke. Also, heat can&apos;t get out of the engine and cylinder, so it&apos;s very important to keep the air and circulation systems well maintained, clean, and unrestricted." Another development is aftercooling (also known as intercooling). When air is compressed in a turbocharger, it heats up rather quickly. Aftercooling with raw water or a water jacket in the engine cooling circuit cools the compressed air before it enters the engine, resulting in better, cleaner combustion. The turbo pressure is the same, but the air is much cooler, which is great for combustion. Most larger turbocharged diesels use aftercooling, and overall performance is enhanced. Aftercooling also helps improve engine component life. All of these comments apply to gensets as well, as there is a growing number of genset units using turbocharged diesel engines, often with aftercooling. 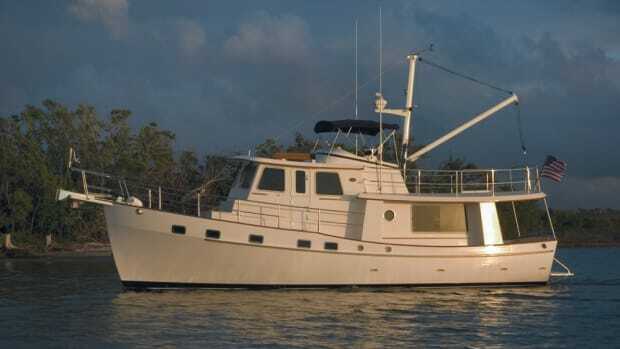 Almost all commercial and fishing boats are using turbocharged diesel engines these days. The operators need the power, and turbocharging gives it to them in smaller, reliable propulsion systems. These are the same boats that also don&apos;t have complex get home systems, and are out at sea for long continuous duty. Perhaps it is time that we pleasure boaters, who are, after all, in this for fun, should get with the program...and stop listening to an old argument that is no longer valid. I know it runs against what they have said for many years, but turbocharging is not what it once was. Personally, I used to hold the same old fashioned opinions as everyone else out there, preferring to stay a naturally aspirated man forever. But I&apos;m smarter now. I can see things have changed, and now so must I.
Deere Marine expert Bob Tokarczck is also pretty comfortable with today&apos;s turbo diesels, and summed it up best. "The engines today give better performance, and they are just as reliable as the naturally aspirated engines. Big, slow-turning diesels are still the way to go, but adding a turbocharger does not change that reliability-and results in a better overall engine." When I finally build that ideal passagemaker for myself, you can bet she will have one big diesel sitting center stage in the engine room. Chances are the engine will be turbocharged. I just know I&apos;ll grow to love that whine of the turbine, spinning itself to higher horsepower, while doing a fine job of keeping my environment clean. And yours.